The UN Human Rights Office (OHCHR) said on Wednesday [16 January 2019] that at least 890 villagers were reportedly killed in the western Democratic Republic of the Congo last month, following brutal inter-communal clashes. © UNHCR/Ley Uwera | A site for Internally-displaced persons in the Democratic Republic of the Congo. Human rights reports suggest that the apparent massacre took place between 16 and 18 December in four villages in the Yumbi territory, Mai-Ndombe province, in what appear to have been clashes between the Banunu and Batende communities. 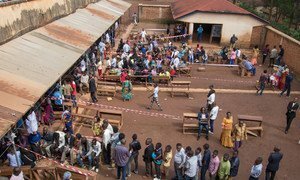 Most of the area’s population has reportedly been displaced, and voting in the December 30 presidential poll for the Yumbi area, was postponed due to violence and insecurity. In a statement, the UN High Commissioner for Human Rights condemned the “shocking violence” and highlighted the importance of “investigating and bringing the perpetrators to justice”. At least 82 people were also injured in the attacks, according to the “credible” reports received by OHCHR and some 465 houses and buildings were burned down or pillaged, including two primary schools, a health centre, a health facility, a market, and the local office of the independent electoral commission, known by its French acronym, CENI. Both the OHCHR and national judicial authorities, have launched investigations into the reported attacks. At the beginning of January the UN Refugee Agency, UNHCR reported that 16,000 people from DRC had arrived in neighbouring Republic of the Congo – also known as Congo-Brazzaville – after fleeing deadly intercommunal clashes. According to UNHCR, this represents the largest influx of refugees in over a decade, since 130,000 people were forced to seek shelter amid ethnic clashes in DRC’s former Equator Province, in 2009. (SOURCE: UN News).